The other afternoon our house was filled with four extra kids and a lot of energy. Four of the younger kids begged for an art project to do, so we pulled out our new Fiddle and Doodle Markers and decorated paper plates. I loved watching them make different patterns and chat. Once we finished decorating the plates, the kids ran off to do something else and I started brainstorming what to do with all of the colorful paper plates I had in my kitchen. I experimented with one of the plates and turned it into a dinosaur. My 4-year-old fell in love with the project and for our family date night tonight he decided that we had to all make paper plate dinosaurs together! These colorful paper plate dinosaurs are a perfect addition to DINOSAUR WEEK. 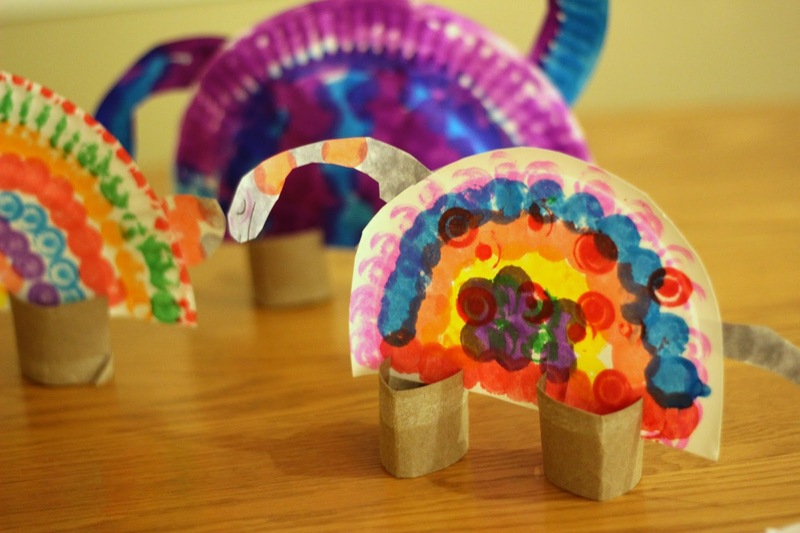 This week we featured Goldilocks and the Three Dinosaurs by Mo Willems and we already made a cardboard dinosaur craft and we painted with toy dinosaurs. 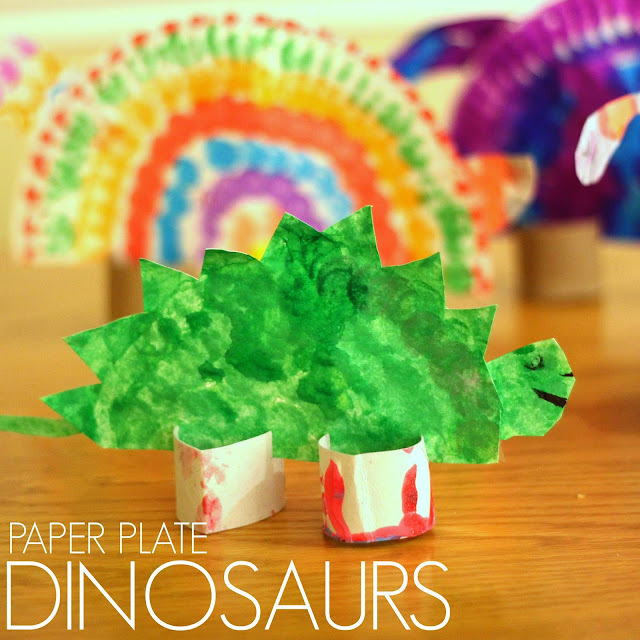 Paper plate dinosaurs are super easy to make and look adorable! This post contains Amazon Affiliate links. To get started we just decorated the paper plates with dot markers. Next we cut the paper plate in half. We put one side to the side and we cut a head and tail out of the other side. After that, we cut out the dinosaur head and tail and taped it to the dinosaur paper plate body (half a paper plate). 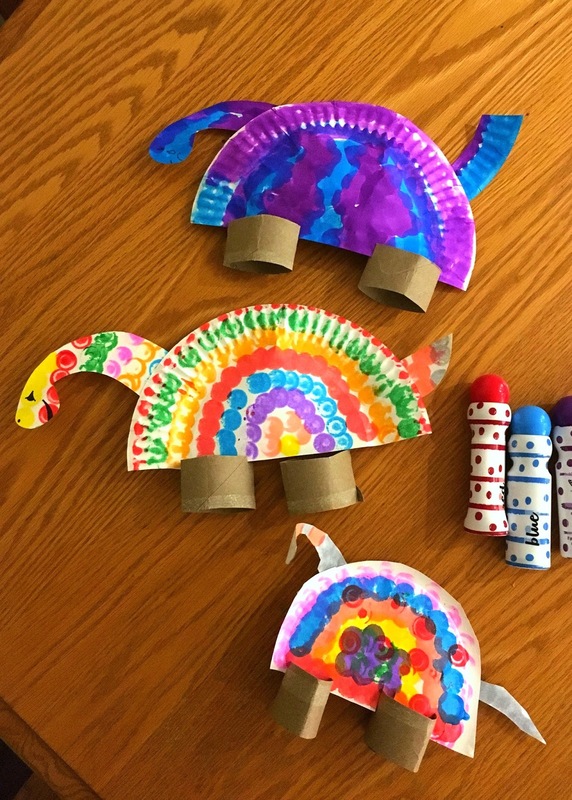 To finish the dinosaur, we cut two pieces of a paper towel roll and put slits on the side of each roll so that we could easily slide the paper plates in. The dinosaurs stayed up really well and the kids had fun moving them around and playing with them. My son was especially proud of his dinosaur that he made. I was so impressed with his creativity! Although you can use the basic format to make each dinosaur, each dinosaur looks very different. We used markers and pens to add some details like eyes and mouths. Even my husband got into this activity and made his own paper plate dinosaur. It was such a family date night idea! 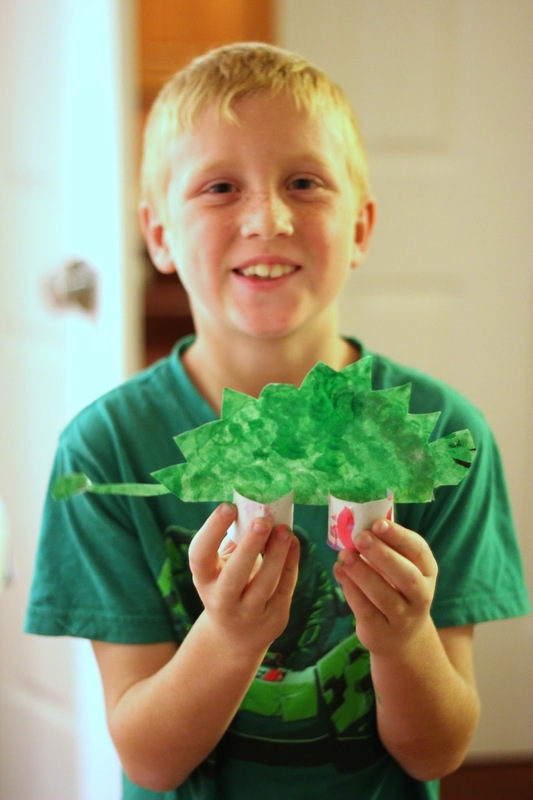 Have you ever made a paper plate dinosaur? 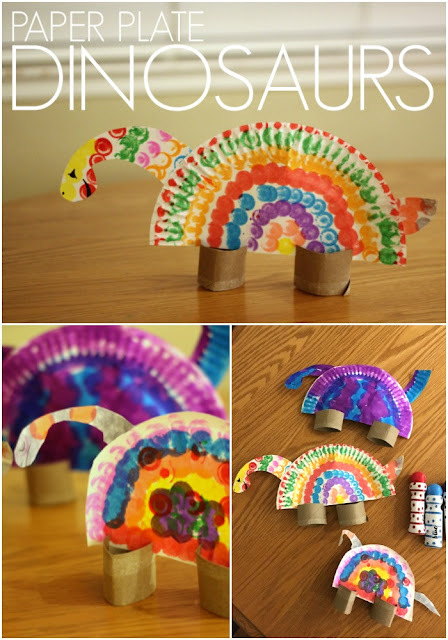 Do you have any other favorite dinosaur or paper plate crafts you can share? Here are 30 of our favorite paper plate crafts if you need more ideas. Also check out these fun activities using our Fiddle & Doodle art dabbers.